See Domestic Gag Rule Press Release here. More on Domestic Violence Awareness Town Hall with Speakers here. More on Domestic Violence Awareness Town Hall in Brevard here. We’ll have great speakers and performers as always! Women’s and progressive organizations will have tables around for you to visit at Halifax Mall. More information at https://www.raleighwomensmarch.org/. Read about some of the speakers at Raleigh Women’s March Speakers. 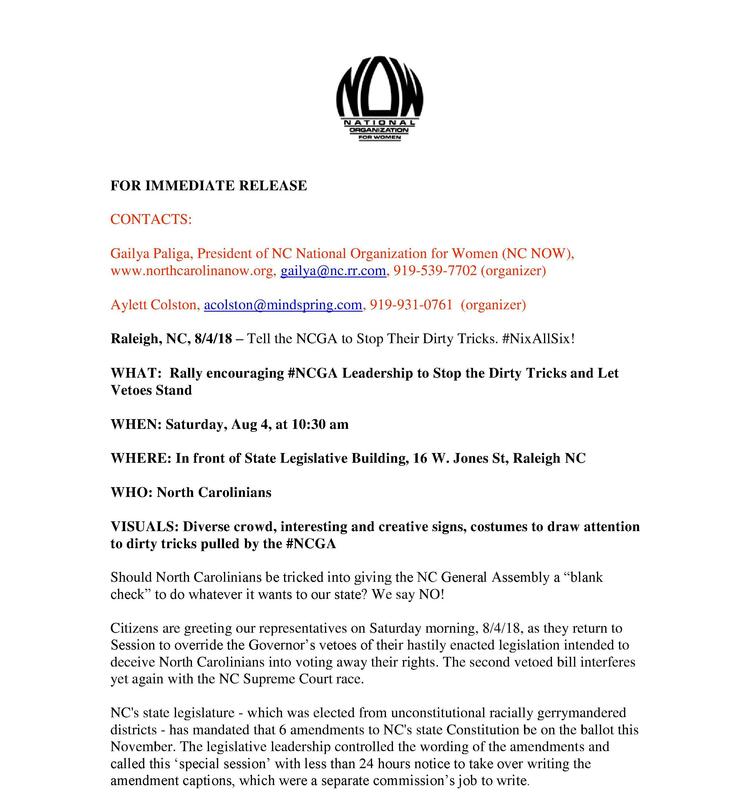 See actual press advisory, which included Raleigh Women’s March on 1/26/19 and a press conference on 1/23/19 at https://wp.me/p22b2e-213. Never has the need been greater than in 2018 for women to push back and move forward. Decades of progress towards women’s equality is being turned back by the current administrations in Washington, D.C., and in North Carolina. When: Saturday, October 20, from 9:00 AM-4:00 PM; Registration begins at 8:30 AM. Raleigh, NC, 8/5/18 – The Durham City Council passed a resolution endorsing the Convention on the Elimination of Discrimination Against Women (CEDAW) unanimously on August 6, 2018 in their general meeting. ”Passage of this resolution reflects a strong commitment to improving women’s human rights in Durham,” said Beth Dehghan, President of WomenNC. See the rest of the press release, including more information about CEDAW here. 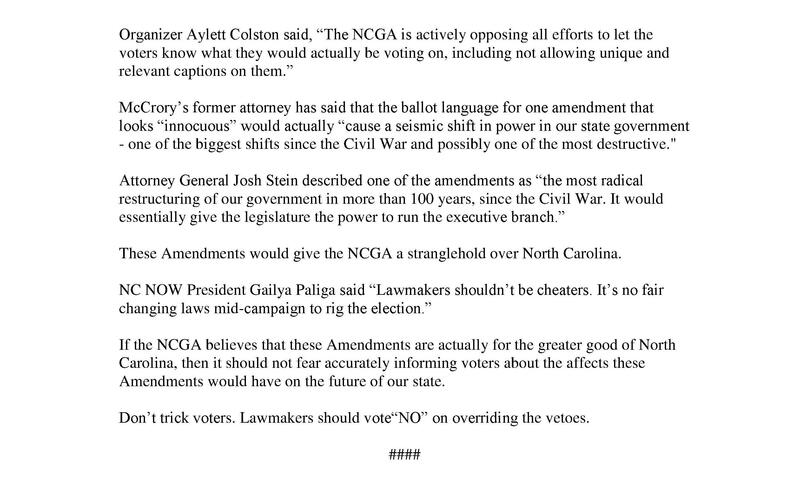 Find the MediaAdvisory in pdf form for “NCGA Stop The Dirty Tricks. NixAllSix.” here. Federal and North Carolina policies regarding women’s health are having a devastating effect on women’s lives. North Carolina currently has 112 Crisis Pregnancy Centers (CPCs), 94% of which do not employ any medical professionals. These clinics are operated by religious groups whose aim is not to provide health care but to discourage abortion, and they have been found to give false and misleading information which delays or complicates women’s lives and health. NC is funneling $2.6 million in taxpayer money over two fiscal years to Carolina Pregnancy Care Fellowship, a nonprofit network for eight CPCs in the state. They exist to prevent abortion, as you can see from their website. Compare the 112 CPCs to the 13 actual abortion clinics in NC, and those are in urban areas. About 5 of these clinics are Planned Parenthood clinics. President Trump plans to announce on Tuesday May 22 that his administration will withhold federal funding for family planning clinics that provide abortions or refer patients to places that perform them. By doing this he is taking direct aim at Planned Parenthood, which serves 41 percent of the 4 million women receiving Title X care and would stand to lose as much as $60 million dollars a year. Poor women and women of color will be disproportionately hurt. Abortion rights advocates also argue that the new rules could result in women not receiving reproductive health care at all, leading to more unintended pregnancies and higher mortality rates. They note that Planned Parenthood and other groups that perform abortions are often the only federally funded health care providers in certain areas of the country, meaning that some women in those places will not receive medical care at all under the new policy. Texas cuts to its family planning budget in 2011 by two-thirds, for example, had a devastating effect on women. Its maternal death rate is now higher than anyplace else in the developed world, having more than doubled in the years following these cuts. The Republicans on the House Agricultural Committee have come up with their version of the Farm Bill, and it is due for a vote in the House this week. This bill traditionally is a bipartisan effort every 5 years, but in this case not a single Democrat on the committee voted for it, and it is widely seen as a cruel and extremist attack on the poorest people among us. It includes wide cuts and a reorganization of SNAP, the Supplemental Nutrition Assistance Program (formerly known as Food Stamps) that provides food to 2 million Americans. Coming only 4 months after a tax cut of 1.9 trillion dollars over ten years which will overwhelmingly benefit profitable large corporations and the wealthiest 1% and simultaneous with Secretary Ben Carson’s proposal to increase rent in public housing by up to 300%, this can only be seen as part of a massive transfer of wealth from the poorest to the wealthiest Americans. The Emcee of this rally is Gailya Paliga, President of NC National Organization for Women (NC NOW). The Triangle Raging Grannies will sing some original music. Speakers include Brian Kennedy II of the Budget and Tax Center and Beth Messersmith, NC Senior Campaign Director for MomsRising. “[T]he plan includes sweeping, aggressive new work requirements that would likely prove unworkable and do substantially more harm than good, fueling increases in hunger and poverty. These provisions would force states to develop large new bureaucracies, but research suggests that these requirements would do little to increase employment.This expensive and risky approach runs counter to evidence-based policy making”. Raleigh, NC – 4/9/18 – President Trump’s policies and Congress have had a disastrous affect on women and families in North Carolina, the United States and the world. On Tuesday April 10 at 11:30 am, members and supporters of NC NOW (National Organization of Women), NARAL Pro-Choice North Carolina, El Pueblo, and Population Connection join Tuesdays with Tillis Indivisible to demand that Senator Tillis respond with legislative support to remedy the repressive policies which cost women their lives. Join us as we concentrate on reproductive care and reproductive justice policies at the federal level. Do you know there is a US policy which cuts off all US health funding for other countries as America tries to control other countries’ reproductive care (via the Global Gag Rule, which President Trump instated and expanded in January 2017). And Congress renews the heinous Hyde Amendment every year! The Hyde Amendment prohibits low income women, federal employees and their dependents and others from using their own insurance or Medicaid to cover abortions. This means Congress targets a range of women from getting a specific medical procedure via the Hyde Amendment – and has done so every year since 1976. What: Rally to Save Women’s Lives and protest policies at home and abroad which target women’s access to reproductive health care. The Global Gag rule, the Hyde Amendment, and cuts to state and local funding as well as the erosion of the reproductive rights of women all have legislative remedies. Past versions of the Gag Rule have been devastating to family planning programs around the world impacting $600 million in US foreign aid. The expansion of the policy to other global health programs will be catastrophic—potentially affecting $9.5 billion or more in US aid, according to Suzanne Ehlers, president and CEO of the global reproductive health organization PAI. “Every year, 300,000 women die of maternity related complications – 47,000 as a result of unsafe abortion. That’s why we’re calling on Senator Tillis to support the Global HER Act which would repeal Trump’s deadly Global Gag Rule,” said Amanda Murray of Population Connection said. We call on Senator Tillis to support legislation which would end the Hyde Amendment and repeal Trump’s devastating and deadly Global Gag Rule. Never has the need been greater than in 2017 for women to push back and move forward. Decades of progress towards women’s equality is being turned back by the current administrations in Washington, D.C. and in North Carolina. “When injustice becomes law, resistance becomes duty,” Thomas Jefferson said so long ago. Join us in Fayetteville to find out about the situation in NC and to get some tools for the resistance. Conference Attendees will learn more about the national action plans that the national board has created to help all chapters. Workshops will cover gerrymandering and related lawsuits, ‘Equality Denied: ERA Mobilization Reignites’ and ‘powerful programs that pop!’ and more. When: Saturday, October 21, from 9:00 AM-4 PM, registration begins at 8:30 AM. NC NOW President, Gailya Paliga, is available for interviews. For more information about NC NOW, visit www.northcarolinanow.org; or for the National Organization for Women, visit www.now.org. Members of the media are welcome to attend. Advance and on-site interviews can be arranged. For more information about the conference or to attend, contact Gailya Paliga, NC National Organization for Women, president@raleighnow.org, 919-539-7702. ABOUT NOW: NOW’s purpose is to achieve social, economic and political equality for women. As the grassroots arm of the women’s movement, the National Organization for Women is dedicated to its multi-issue and multi-strategy approach to women’s rights. NOW is the largest organization of feminist activists in the United States, with hundreds of thousands of contributing members and more than 500 local and campus affiliates in all 50 states and the District of Columbia. North Carolina has seven active NOW chapters serving Asheville, Chapel Hill, Charlotte, Durham, Fayetteville, Raleigh and the Triad (Winston-Salem/Greensboro/High Point). Durham County, First Women Human Rights County in South! Durham County Board of Commissioners passed a CEDAW resolution unanimously at their general meeting on September 11, 2017. The Convention on the Elimination of all Forms of Discrimination against Women, or CEDAW, is an international mechanism that outlines women’s fundamental human rights treaty. The Counties and Cities for CEDAW campaign is a national grassroots effort that provides tools and leadership to empower local women’s organizations and municipalities to effectively protect women’s human rights within their city, county, or state. Durham County, the average man earns more than $14,000 more each year than the average woman while women, ages 25-34, are the largest population of people in poverty. At least 13% of teenagers in the county have experienced sexual assault. For more statistics on these issues, check out https://datausa.io/profile/geo/durham-county-nc/ and http://www.womennc.org/ Durham continues to face gender inequity issues related to a lack of affordable housing, rates of unemployment, intimate partner violence, wage inequalities, healthcare and more. While Durham County is one of the most progressive counties in North Carolina, it has the potential to make enormous strides for women and girls! While the federal government may not be willing to codify this convention into law, cities and counties across the country are playing an important role in implementing CEDAW, directly impacting the everyday lives of countless people in the United States. 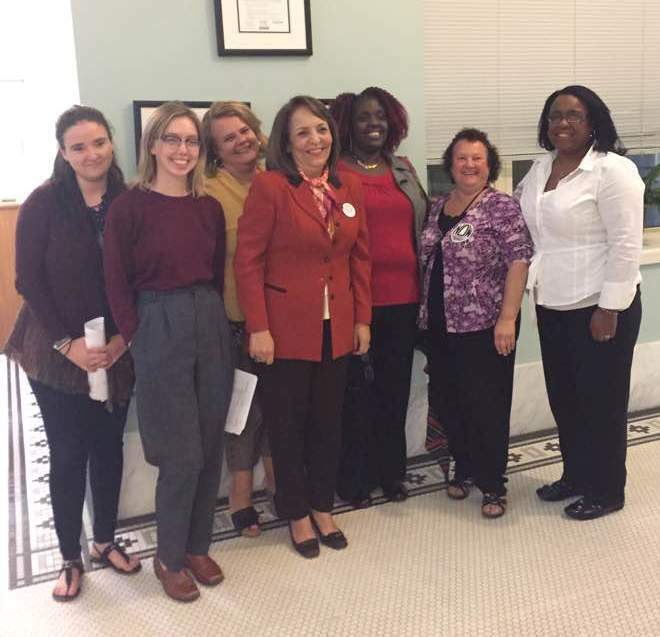 The North Carolina Cities and Counties for CEDAW Coalition brings together advocates, the Durham Women’s Commission, university students, and government officials in North Carolina to implement the principles of CEDAW in our towns, cities, and counties through the following. Research conducted by university students and led by WomenNC and the North Carolina Coalition for CEDAW member organizations on women’s health, economic disparities, childcare, violence against women, employment, education, and leadership. These research reports will emphasize the lives of African-American and immigrant women. Reviews of these research reports by the Durham County Women’s Commission to present an annual plan to the Durham County Commissioners with recommendations on policy changes and allocation of the budget for women-related programs. Since 1998, several counties and cities across the nation have adopted such an ordinance reflecting CEDAW principles such as Pittsburgh, Louisville, Cincinnati, Kansas City, Pale County, Miami, Tampa, Salt Lake City, Sarasota, New Orleans, Dale City, Eugene, Los Angeles, Berkley, and San Francisco. These cities and counties have used the CEDAW human rights framework to guide policymaking, developing a number of innovative programs and tools to advance women’s human rights. This coalition welcomes multiple stakeholders including elected officials, commissions, the media, business, youth, NGOs, faith communities and women leaders. The campaign will focus on engaging advocates and government officials in communities of all sizes and regions. The coalition includes ActionNC, NC National Organization for Women (NC NOW), NC Women United, AAUW-NC, League of Women Voters, United Nations Association of Wake County, UN WomenNC chapter, the Pauli Murray Center for History and Social Justice, Durham NOW, Durham Crisis Response, and the Durham Women’s Commission. Today’s narrow vote for a disastrous health care bill will come back to haunt House Republicans. The members of Congress who voted for this bill have sealed their fate with the electorate. Billionaires and conservative superPACs may have bought their vote today, but they can’t buy a blindfold big enough to keep voters from seeing the truth. The truth is that this bill will take health insurance away from tens of millions of people, many of whom are already living at the margins. The bill encourages mean-spirited Republican governors to opt out of the essential health benefits that are a lifeline to so many, and to allow insurance companies to deny benefits to tens of thousands of people with pre-existing conditions. Under the AHCA, surviving sexual assault or domestic violence, battling postpartum depression, or having a cesarean section would all be considered pre-existing conditions–at a staggering cost to women. Black women are at a disproportionate risk for breast cancer than other racial and ethnic groups, and breast cancer survivors would see their premiums shoot up by over $28,000. Now, it’s up to voters to deny their bought-and-paid for members of Congress another term in office. We will make it our top priority to unseat everyone who voted for this extremist attack on our health care rights today. On May 1, as people around the country rise up to take action for immigrant rights, I am thrilled to announce the launch of NOW’s targeted campaign to protect immigrant restaurant workers. Right now, immigrants across the country are facing extreme xenophobia. Immigration and Customs Enforcement (ICE) raids are breaking apart families–deporting individuals whose documents may not be in order, but who nonetheless help to sustain the U.S labor force and create vibrant communities. The restaurant industry employs 1.1 million undocumented immigrants, and 52% of all restaurant workers are women. Individual restaurants are uniquely poised to make a difference in the lives of immigrant workers, and activists can help make this happen. In partnership with Restaurant Opportunities Centers (ROC) United, NOW is calling for restaurants around the nation to become Sanctuary Restaurants. Sanctuary Restaurants designate themselves as establishments where xenophobia, sexism, and racism will not be tolerated–and actively work to protect their employees from discrimination. Immigrant rights supporters around the country can participate in the campaign by asking their favorite restaurant to consider becoming a Sanctuary Restaurant. No human being is illegal, and all people deserve to be treated with dignity and respect at work. This May Day, and as we continue to grow this Sanctuary Restaurants movement, we need to take our activism hyper local to protect the rights of undocumented people. Activists: look to your communities, and fight for your neighbors. Donald Trump’s first 100 days have taken a terrible toll on women. Fayetteville National Organization for Women (NOW) will hold a community forum on January 25, 2017 from 6:00 pm to 8:00 pm at the North Regional Library at 855 McArthur Road in Fayetteville. The speakers will discuss “The Elections Results Impact on Reproductive Rights”. Panelists will be Naveed Aziz, MD, Heather Williams, Health Educator for Planned Parenthood and The Honorable Rick Glazier, Director of the North Carolina Justice Center. Dr. Aziz practices medicine in Spring Lake. She serves on the Board of Better Health and provides free diabetes education seminars for the public that are attended by around 150 people and conducted every three months. Heather Williams provides health education programs for young people and will talk about those programs. Rick Glazier is a former legislator and is the Executive Director of the North Carolina Justice Center that provides policy analysis on many issues. Questions from the audience will be entertained. 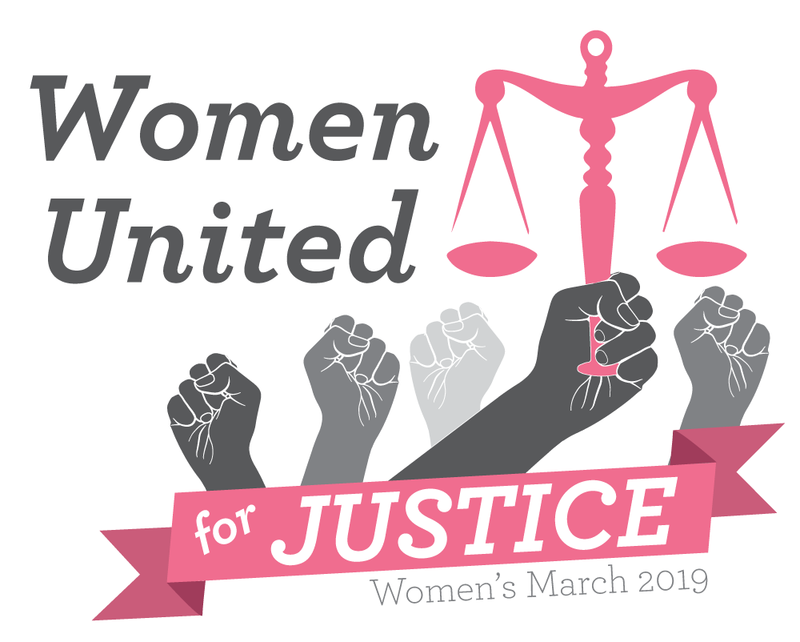 Raleigh, N.C. – A multiracial, multi-religious, and multi-generational grassroots group of women are planning a Women’s March on Raleigh (WMOR). It is a solidarity event with the Women’s March on Washington, also taking place January 21st, 2017. Dozens of women and allies have been planning the march from the basement of Pullen Memorial Baptist Church for the past several weeks. Reverend Michelle Laws of the NAACP is a confirmed speaker, as well as MaryBe McMillan of the NC AFL-CIO and Sarah Preston of Lillian’s List. Read the entire press release, including quotes from organizers Salma Mirza, Carly Jones, Anna Grant, and NC NOW’s President, Gailya Paliga at WMOR Press Release. 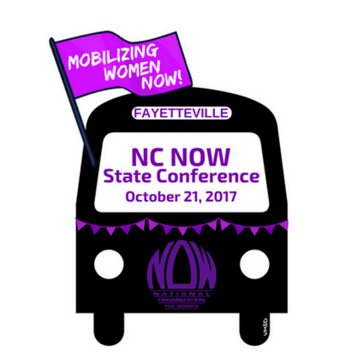 2016 is a banner year to celebrate “Women Making History NOW!” NC National Organization for Women (NC NOW) celebrates the 50th anniversary of the NOW’s founding, as well as the nomination of the first woman for president by a major political party, at our annual conference on Saturday, October 1 in Raleigh. We’ll look at how far women have come in 50 years and what we still need to do for all people to be treated truly as equals. Our keynote speaker is State Auditor Beth Wood, who will speak about ‘the female effect.’ Please join us! Press release about how the new law resulting from House Bill 2 (HB 2) goes way beyond the LGBT community. The extensive changes to protections in this bill hurt women in shocking ways. Published 4/7/16. This press release was emailed on 3/2/16. It was posted on the NC NOW website on 3/2/16. See it at PRESS ADVISORY SWWW Final.